Here you will find a few of the items used in the TV show. On the wedding day of Snow White and Prince Charming/James, the Evil Queen arrives and delivers an ominous threat about a powerful curse she intends to release upon them. 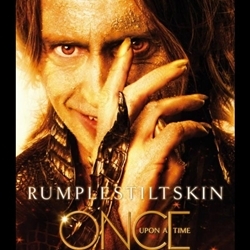 Some time later, a pregnant Snow White is worried about the curse and visits Rumpelstiltskin, who issues a prophecy that the Queen's curse will take them all someplace terrible where there will be no happy endings. He also reveals that Snow White's unborn daughter, Emma, will return when she is 28 years old to rescue them, thus beginning the final battle with the Queen. On advice from the Blue Fairy, Geppetto and Pinocchio fashion a wardrobe from a magical tree which will allow one person to escape the Queen's curse. Prince Charming intends for Snow White and their unborn daughter to use the magic tree to escape the curse, but Snow White goes into labor and gives birth to Emma just as the wardrobe is about to be completed. On the day Snow White gives birth to their daughter Emma, the Queen's curse strikes. Prince Charming places their daughter in the magic wardrobe, but is grievously wounded battling the Queen's henchmen. The Queen stands triumphantly over Snow White and Prince Charming as the curse takes them to "someplace horrible." Designed to hold a foam LARP Sword or Dagger from a waist belt at an angle, this leather LARP frog is supplied with extra long ties that adjust to fit all size foam swords or daggers. Available in right-hand draw, or left hand draw. Designed to hold a dagger scabbard from a waist belt at an angle, the dagger frog is supplied with extra long lace ties that adjust to fit all size dagger scabbards. Hand made in the U.S. This desirable Blue Butterfly Ring crafted in sterling silver is an instant classic and suitable for all occasions. The Brown Stoneware Drinking Mug is hand-turned, so there are variations between each piece. These Stoneware Mugs are completely safe (lead-free) and can be used in the modern kitchen, as well as at camp. Back Scabbard for Medieval Swords is used for carrying a medieval sword on your back. Custom leather scabbard made to fit most medieval swords. Crafted in full grain leather with leather strap and hand forged steel buckle. Our Deluxe Medieval Dagger Frog is designed to suspend a Medieval Dagger Scabbard from a waist belt at an angle. The dagger frog is supplied with extra long lace that adjusts to fit all size dagger scabbards. Our Decorative Angled Sword Frog is custom made from quality leather to fit your sword. This leather sword frog was designed to carry your bare sword blade at an angle from a waist belt. Fits up to a 2 inch belt. Our Decorative Straight Sword Frog is custom made from quality leather to fit your sword. This leather sword frog was designed to carry your bare sword blade from a waist belt. Fits up to a 2.5 inch belt. The Charlemagne sword letter opener is made of cast metal. The manufacturer of the letter opener is Denix, and it is made in Spain. The Charlemagne sword letter opener is a smaller version of the functional Charlemagne swords. This letter opener has an overall length of 9.6 inches. Freemasons of the 18th and 19th centuries gave the Masonic Sword as an award of rank and merit. Engravings on the sword and scabbard display the symbols of the movement. The Richard the Lionheart Sword by Denix, complete with scabbard, is a representation of the sword he carried in his quest for Jerusalem. Safe for display in family environments. This Charlemagne Sword has a low maintenance stainless steel blade that is mirror polished. Decorative use only. Our sword scabbards are constructed in a historically accurate fashion and can be made to fit most medieval swords. Crafted in full grain, quality leather. Comes with hanging straps for sword belt (not included). Guingate Sword with Brass guard and pommel, bone grip. Halberd has a Functional Axe Head is hand forged from steel, wooden pole available. Our Excalibur Letter Opener is a 6.5in pewter long letter opener is supplied in a box with clear lid together with historical information. Our Extra Bow String - endless string - double loop string is the best value in bow strings period. Made of B-50 dacron, waxed nylon, safe on any bow. End loops reinforced with braided nylon to last , the centers are also served with braided nylon. The Hanwei Tinker Pearce Early Medieval Sword Blunt Trainer by Paul Chen is a typical 13th - 14th century single hand sword with Type XII blade. The Blunt trainer is an exceptional match for I.33 sword and buckler study. Associated mainly with the French Monarchy, the fleur de lis remains an enduring symbol of France. Crafted in sterling silver; this ring features the fleur de lis, delicately accented with knotwork. This sturdy bag is decorated with a professionally embroidered Thor hammer. Common during the 11th-14th centuries, the Double Wrapped Sword Belt distributed the weight of the sword and scabbard across both hips, which made it extremely comfortable and prevented the belt from sagging. Right Hand Draw. Our Feromonic Field Detector Steampunk Gothic Ring is a scientific tuning device gauging gender by blood iron content, found essential in making accurate settings for the successful transposition of bio-matter and a moveable dial indicator. The Hanwei Tinker Early Medieval Replacement Sword Blade Blunt by Paul Chen is a Longsword blunt sparring blade that may be used either to replace severely worn sparring blades or to convert the Early Medieval cutting sharp (SH2404) to a sparring format. Common during the 11th-14th centuries, the Double Wrapped Sword Belt distributed the weight of the sword and scabbard across both hips, which made it extremely comfortable and prevented the belt from sagging. Left Hand Draw. This Green Dragon Topsy Turvy Mug is made from ceramic and hand painted. Approximately 5.5 x 4 x 4.75 inches, this small mug looks as good on the shelf as it does in your hand. Double LARP Sword Hanger in Brown Leather is a fully adjustable sword hanger system for LARP swords and daggers. Can be used for left hand and right hand draws. Leather straps let you adjust your rig to comfortably draw your sword or dagger. Double LARP Sword Hanger in Black Leather is a fully adjustable sword hanger system for LARP swords and daggers. Can be used for left hand and right hand draws. Leather straps let you adjust your rig to comfortably draw your sword or dagger. Our pouches are suitable for your Renaissance and Medieval clothing. Tough leather with a smooth finish. Our sword scabbards are constructed in a historically accurate fashion and can be made to fit most medieval swords and daggers. Crafted in full grain, quality leather in the U.S.
Our Large Period Pouch is a large and roomy leather pouch which could be used for many historic periods, from Medieval to Renaissance or even Pirate eras. Large enough to carry your feast gear with ease the Large Period Pouch can be used for SCA, LARP events, Faire or Theater! Medieval Archers Quiver is hand constructed from leather and holds over a dozen arrows. Designed for the Medieval Archer this Quiver is Custom made to fit your arrow length and includes belt. The Heralds trumpet will sound a rousing fanfare for lords and ladies or decorate castle walls to perfection! Crafted in drawn brass and measuring an imposing 50 inches long, the trumpet can be supplied with an optional banner. Measuring 7 inches wide and 8 inches tall, this pouch lays flat when empty but expands 3 inches to hold your necessities. Made in the U.S. of top quality leather and fits a belt up to 3 inches wide. A great little bag to hang from your belt to keep all your little treasures in. Choose from red, cream or brown. Our Medieval Knight's Belt with Antiqued Brass Roses Black Leather is the perfect choice for almost any medieval knightly outfit. The extra long 80 inch heavy grade leather belt is gorgeously accented with antiqued brass roses and a heavy duty buckle. Also available in Brown, item # 200678. From the early Celts to well past the Renaissance, warriors knew that a double wrap belt was a more comfortable way to carry a sword. But it was in Medieval times that the practice really flourished. When the extra length of belt wraps around a body the second time, both hips then support the weight of the sword. The Left Handed European Baldric fits any period from Roman to Viking to Renaissance. The baldric was a favorite way to wear a sword since biblical times, the use of the baldric continued into the 17th century. Black or Brown leather with brass buckle. Our Rumpelstiltskin's Cloak Clasp measures 3 1/2 inches by 1 3/4 inches high. This Rumpelstiltskin's Cloak Clasp has a double hook and eye closure on the back and with four points to attach to each side of the cloak. A Wooden Excalibur Sword or ''waster''allowed a warrior to practice full combat safely. Fully seasoned and hand crafted in solid hardwood. This Medieval Style Wooden Bowl, 7 Inch diameter, is turned from solid hardwood. Medieval Sword Belt - 14th to 15th Centuries - Brown Leather. Designed to suit the needs of 14th - 15th cen. style swords. All leather construction, extra long belt, sturdy buckle, 2 leather straps extend to attach to the scabbard. This classic style leather Viking pouch was worn for hundreds of years. The simple construction allows for a simple pull of a drawstring to secure the pouch and then allows it to be tied to a belt or saddle. Our pouch also includes 8 Viking coins. This Red Dragon Topsy Turvy Mug is made from ceramic and hand painted. Approximately 5.5 x 4 x 4.75 inches, this small mug looks as good on the shelf as it does in your hand. Leather Swordman’s Baldric in Brown Leather is a fully adjustable sword hanger system designed primarily for LARP swords and sabers. This sword rig will also work for medieval swords or swords with scabbards. A Leather Double Wrap Sword Belt is a more comfortable way to carry a sword. The extra length of belt wraps around a body the second time, both hips then support the weight of the sword. Made of beautiful leather with brass studs and buckle. This adaptable Norseman belt is made of soft, interlaced leather. Features a distressed finish on the outside. Fits 34 to 42 in waist. Medieval Sword Belt - 14th to 15th Centuries - Black Leather. Designed to suit the needs of 14th - 15th cen. style swords. All leather construction, extra long belt, sturdy buckle, 2 leather straps extend to attach to the scabbard. This sturdy shoulder bag is the perfect accessory for safely storing your everyday and valuable items! Hand sewn, it is made of genuine leather combines strength and realism.